As NASA's Mars Exploration Rover Opportunity neared the ninth anniversary of its landing on Mars, the rover was working in the 'Matijevic Hill' area seen in this view from Opportunity's panoramic camera (Pancam). 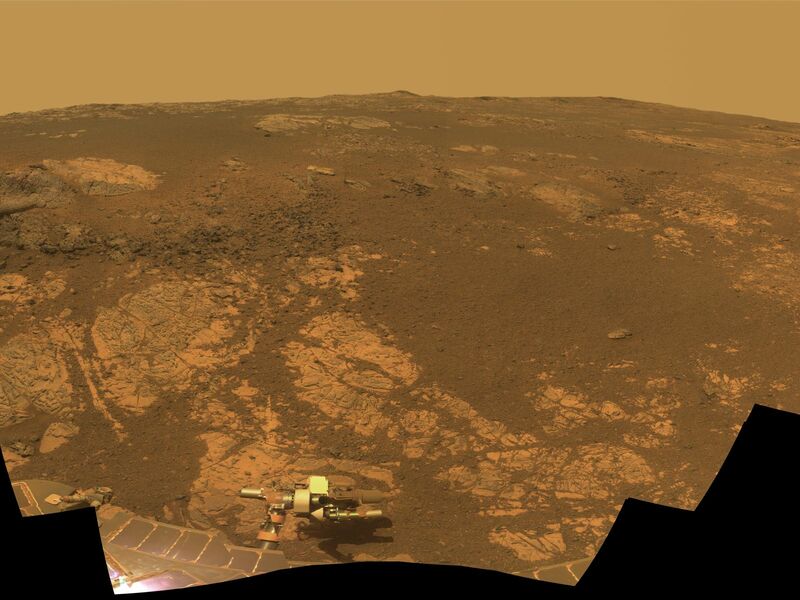 Opportunity landed Jan. 24, 2004, PST (Jan. 25 UTC). 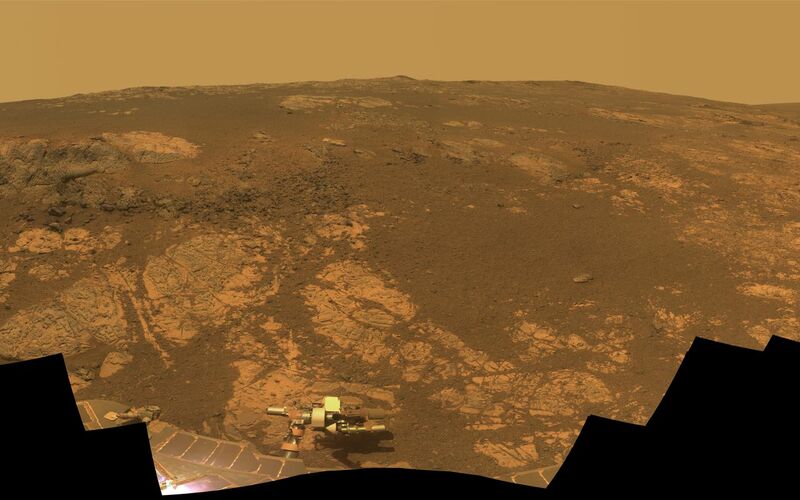 The landing site was about 12 miles (19 kilometers), straight-line distance, or about 22 miles (35.5 kilometers) driving-route distance, from this location on the western rim of Endeavour Crater. Matijevic Hill is an area within the "Cape York" segment of Endeavour's rim where clay minerals have been detected from orbit. This view is centered northwestward, toward the crest of Cape York. It extends more than 210 degrees from left to right. The field of view encompasses most of the terrain traversed by Opportunity during a "walkabout" in October and November 2012 to scout which features to spend time examining more intensely. Two of the features investigated at Matijevic Hill are "Copper Cliff," the dark outcrop in the left center of the image, and "Whitewater Lake," the bright outcrop on the far right. 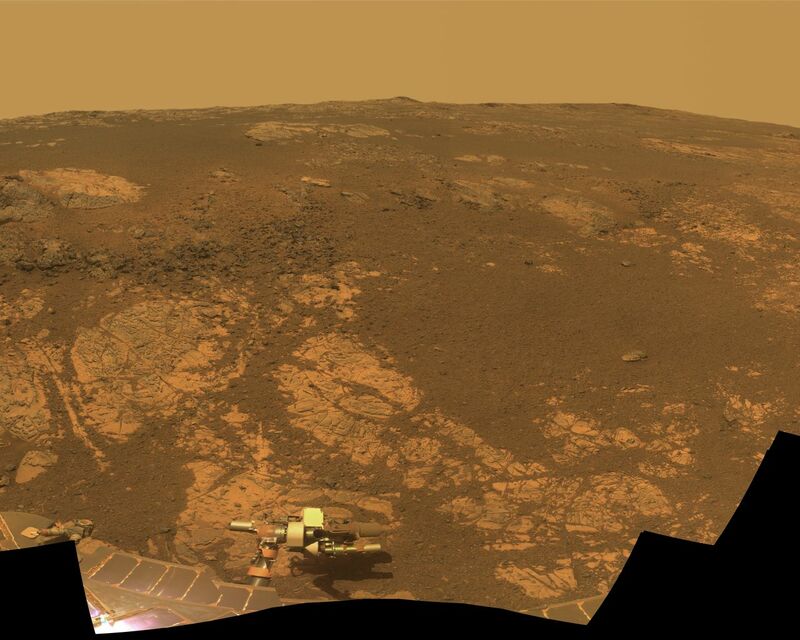 Opportunity's Pancam took the component images for this mosaic during the period from the mission's 3,137th Martian day, or sol, (Nov. 19, 2012) through Sol 3150 (Dec. 3, 2012). The image combines exposures taken through Pancam filters centered on wavelengths of 753 nanometers (near-infrared), 535 nanometers (green) and 432 nanometers (violet). The view is presented in approximate true color. This "natural color" is the rover team's best estimate of what the scene would look like if humans were there and able to see it with their own eyes.